The Calgary Flames made their first big splash of the summer Wednesday afternoon as they signed Czech centre Roman Cervenka to a 1-year deal with a salary of $3,775,000. Cervenka is just coming off of a lengthy but bittersweet playoffs with Avangard Omsk of the Kontinental Hockey League as they lost in the Gagarin Cup Finals against Moscow Dynamo in 7 games, blowing a 3-1 series lead in the process. With this signing, Feaster has essentially all but guaranteed that Olli Jokinen will not be returning to the Flames next season, especially if the Finnish centre is seeking a contract value similar to what he would get on the open market. The surprisingly high price tag attached to Cervenka is likely similar to what Jokinen would have gotten out of the Flames, and the newly signed Czech centre is simply a better deal given that he does not turn 27 until December while Jokinen will turn 34 in that same month. While the Flames will obviously hope for Cervenka to produce similar, optimistically greater, numbers than Jokinen they have made a definitive statement by choosing youth over experience. There is nothing to suggest that Cervenka cannot at least break the 50 point barrier his first season in the NHL, especially if he is going to be given top-6 minutes and accompanying power play time. Although his regular season with Omsk (54 GP-24 G- 16 A- 39 PTS) was a drop off from his goal-scoring champion previous season with the KHL club (51 GP-31 G-30 A-61 PTS), he was stellar during the playoffs as he posted 11 goals and 22 points in 20 playoff games. While the KHL is obviously not the elite league that the NHL is, top-end production in the former league can sometimes translate to the latter as Alex Radulov showed in Nashville’s first round series against the Red Wings. 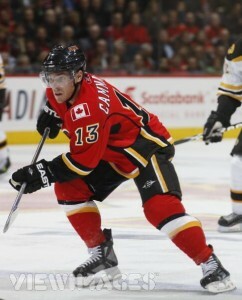 Mike Cammalleri is the Flames most proven centre, and he doesn't play the position full-time. That being said, this move is still a hefty gamble by the Flames brass. If Cervenka proves to be a flop in the NHL, the Flames will be among the thinnest in the NHL down the middle. The likely loss of Jokinen leaves the Flames without a single centre who has had a season with at least 60 points, unless you count Michael Cammalleri who splits his playing time between centre and wing. This means that the Flames will rely heavily on scoring from the wing, not only putting extensive pressure on Jarome Iginla and Alex Tanguay to produce but also on rookie Sven Bartschi, who will have to play himself out of a job at training camp. While the Flames will continue to tinker with their roster throughout the summer, they have indeed put themselves in a precarious position by investing heavily in a player that is expected to play in a top 6 capacity but has yet to play a single minute of NHL action. Adversely, this move is a refreshingly drastic departure from typical personnel moves the Flames have conducted in the past. Rather than bring back an ex-Flame or aging NHL veteran, the Flames are choosing to have faith in the word of their European scouts and have rolled the dice on an unproven, European player. 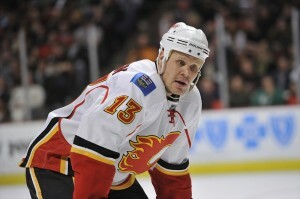 Regardless of the end result, no one can deny that the Flames are branching out in an effort to return to prominence.